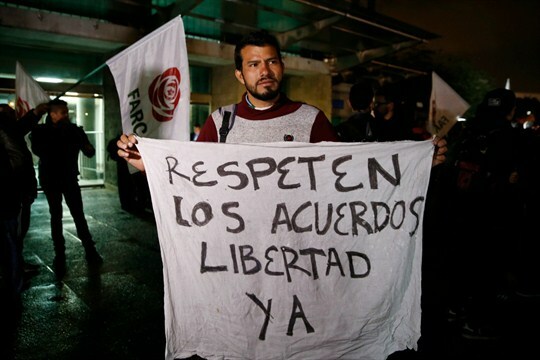 A supporter of former FARC rebel Jesus Santrich holds a sign that reads in Spanish “Respect the freedom agreements” during a protest against his arrest in Bogota, Colombia, April, 9, 2018 (AP photo by Fernando Vergara). Signs of strain are emerging over Colombia’s landmark 2016 peace accord that ended a 50-year war with the country’s largest guerrilla group, the Revolutionary Armed Forces of Colombia, or FARC. Key aspects of the agreement still haven’t been implemented, while its transitional justice system, arguably the most important element of the reconciliation process, suffers from mistrust and a lack of buy-in on both sides. In an interview with WPR, Mathew Charles, a journalist and academic in Colombia, discusses the impediments to peace and how to overcome them.